Formoline L112 is available to buy in most countries in the world, including Australia. A few years ago it was proclaimed to be one of the best selling commercial diet pills In Germany. Formoline L112 is advertised as a cost effective fat binder comprised of natural ingredients. It is meant to assist dieters in lowering their consumption of calories each day by preventing or stopping a certain amount of dietary fat from getting absorbed inside the belly. 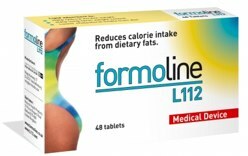 The manufacturers of Formoline L112 claim that their product will lessen the percentage of fat you eat each day without you having to change your normal diet. The primary ingredient featured in the product’s formula is polyglucosamine. This is a natural, active fibre which attaches itself to the fat in your diet, lowering the quantity you digest. Polyglucosamine isn’t digested by the stomach, so all of the fat that attaches or binds to it gets moved, in tandem, right through your digestive system to be expelled from your body as waste. Basically, the fat attached to the active ingredient isn’t absorbed so your body doesn’t get access to any calories that the fat would provide otherwise. Additionally, the indigestible and expanded fibres evoke a feeling of fullness or satiety ( an appetite quelling effect). The dosage recommended is 2 Formoline L112 tablets twice each day with food. When you have achieved your ideal weight, just one tablet twice each day is required. Formoline L112 ought not to pose any health problems when taken as directed. Any reported instances of side effects are extremely mild and rare. Its’ active ingredient is comprised of a derivative of shellfish though, so all those who have a shellfish allergy should avoid it. Vegetarians, obviously, should also take note of the shellfish connection mentioned above. The clinical data available is not very compelling – this is common with many diet products based on shellfish or crustaceans. To date, there’s no clinical proof to demonstrate that polyglucosamine functions as a weight loss aid or a fat binder. However, there are several studies which indicate that glucosamine can facilitate healthy cartilage and joints. Although popular and widely stocked in Europe and parts of the United States it sales to date in Australia have ben disappointing. Before recommending any weight loss product, we prefer to see proven evidence and clinical data indicating it definitely works. Though quite cheap, it’s therefore difficult to endorse the Formoline Fat Binder L112 any more than we would endorse the other fat binders that are currently available on the market. Fat binders are only successful if you usually consume lots of food high in saturated fats and (only then) cut down on a small quantity, i.e. typically 20 to 30%. 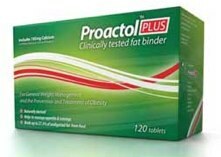 As far as fat binders are concerned its hard to look outside of Proactol Plus. A long history or success in virtually every country that allows free trade. Proactol Plus is considered to be the benchmark fat binder that is forming the basis for new product releases. This entry was posted in Fat Binders and tagged Buy Formoline L112 Australia, Formoline L112, Formoline L112 Australia, polyglucosamine. Bookmark the permalink.